Shortly after you purchase, we will send you an email with ACCESS details to your 1 Year ONLINE SUBSCRIPTION. No shipping cost for this ONLINE digital manual. CLICK HERE to read more about the detailed benefits and specifications of the 1 year subscription to the DIGITAL Welding Manual (ONLINE). The Welding Manual (ONLINE) is a one year subscription to the online / digital version of the referenced service manual. The digital / online version of a Haynes manual includes detailed step-by-step DIY procedures with supporting diagrams to help you understand exactly what needs to be done to repair, service or maintain your vehicle. 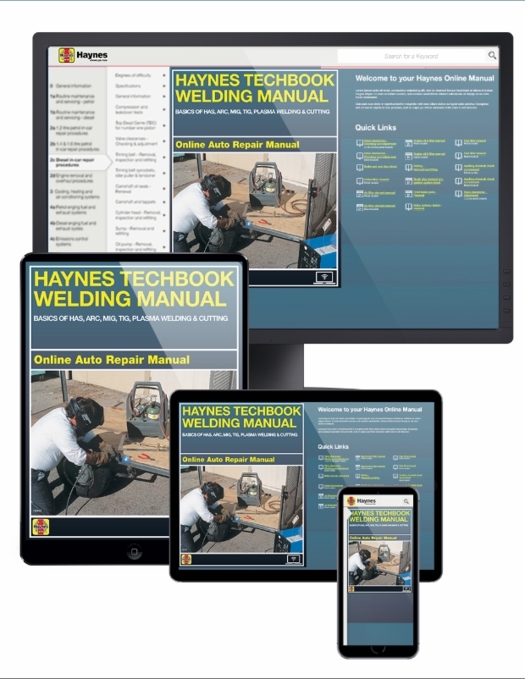 A Haynes techbook is an authority on Welding and will provide great instructions. This manual covers Welding strategies and techniques - a very focused DIY manual for all things automotive Welding. iPad: All Models and versions supported. Ask a question about Welding Manual (ONLINE).